The National Primary Healthcare Development Agency (NPHCDA) has decried the high number of unimmunized children in Nigeria. The Executive Secretary of the NPHCDA, Faisal Shuaib, who spoke at a one-day high-level strategic dialogue on advocacy and accountability on routine immunization in Nigeria, said there are over four million unimmunised children in the country. The dialogue was organised by the development Research and Projects Center (dRPC) in conjunction with the National Association of Community Health Practitioners of Nigeria (NACHPN). The aim of the dialogue is to strengthen the accountability framework for routine immunisation service delivery at national and state levels. The meeting is part of the continuous efforts towards attaining the objectives of Nigeria’s Strategy for Immunization and Primary Healthcare system strengthening, (NSIPSS) 2018-2028. Shuaib was represented at the event by Abdullahi Bulama, Director, Planning Research Statistics, NPHCDA. 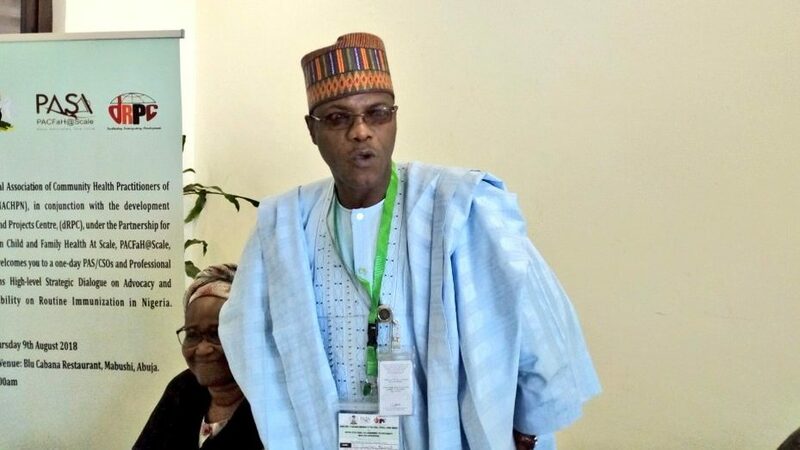 Delivering a keynote address on behalf of his boss, Bulama said the NPHCDA is doing everything to change the notion of Nigeria having the largest number of unimmunized children in the world. He said part of the effort the agency has been taking in improving routine immunisation (RI) is that every department in NPHCDA conducts weekly meetings. He revealed that the NPHCDA is working on how Nigeria can start local vaccine production. “We are looking at how we can be on our own feet. This we are doing by seeing how we can start local vaccine production. But with vaccine creation, the resources is limited. This is why GAVI has extended the date for vaccine funding in the country. “GAVI has some concerns that are why they are giving us additional support at this time till the next ten years, hopefully, our economy and resources might have improved,” he said. On his part, Emmanuel Abanida, senior technical advisor at the dRPC, during his presentation, acknowledged the importance of accountability in the federal and state level saying it would ensure that RI goes a long way to reaching all Nigerians. “In 2011, the GAVI board approved that Nigeria and India should have a special package for immunization because they are two large countries. We call it the strategy for large countries. However, the performance of Routine Immunization in Nigeria has become a huge challenge because coverage is very low, funding is very low,” he lamented.